One of the rarest and therefore most interesting trees in Jungle Gardens is Nageia nagi, the Asian Bayberry. This tree is seldom seen in cultivation, though it grows exceptionally well throughout the southern United States. 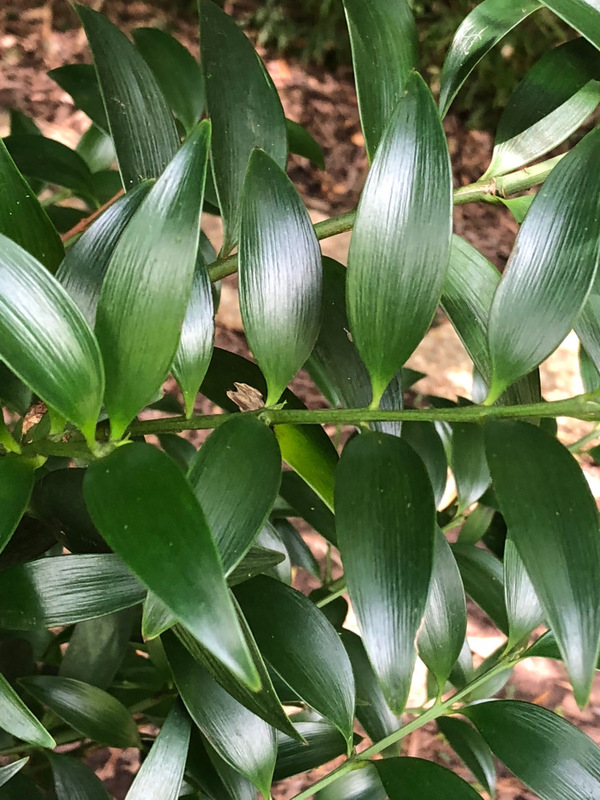 Nageia belongs to the podocarp family, Podocarpaceae, and was previously called Podocarpus nagi, It was recently separated from Podocarpus and other genera in the Podocarpaceae because of its broad, flat, subopposite leaves lacking a midrib. The leaves superficially resemble those of the unrelated and more famous New Zealand Kauri conifer, or Agathis. Nageia‘s very attractive evergreen foliage has distinctive, dichotomously branched leaf venation, a pattern seldom seen in woody plants. The trees are unisexual, producing either male or female flowers. The most impressive Asian Bayberries in Jungle Gardens are those located at Willow Pond near Bird City. Two mature trees are just above the stone walkway that leads from the observation tower of Bird City toward the nearby Giant Bamboo Grove. An extremely large, presumably very old male tree is about 60 feet tall and 19.5 inches in diameter. Nearby there is a much smaller female tree. The pronounced size and age difference between these two trees suggests that a larger female tree was likely present at one time but has since been lost. The smaller female tree is probably an offspring. Numerous young volunteer Nageia seedlings grow in the adjacent Giant Bamboo Grove. The larger male tree has peculiar scaly bark that peels off in vertical strips. The smaller female tree produces an abundance of large, grape-size seeds nearly every year. In the autumn the outer covering of the seeds turns dark purple as they mature and later fall to the ground. A second grove of Asian Bayberries is located directly across from the parking area of Sunken Garden. I estimate there are as many as 60 or more Nageia trees at this location. With the exception of one larger specimen growing apart, the trees range in size from only 1-4 inches in diameter. The sheer concentration of trees in such close proximity makes the grove virtually impenetrable. The large number of similarly sized trees suggests that this grove might have arisen as either a dense planting of young plants or from sown seeds. Many of these small trees are mature, as evidenced by numerous seedlings appearing every year around the grove. These trees should be a the top of the list of plants to find when visiting Jungle Gardens.